This legal podcast defines artificial intelligence and what its growing popularity means for lawyers. A number of lawyers are nervous about artificial intelligence (AI) replacing their jobs in the near future, but most don’t understand AI. 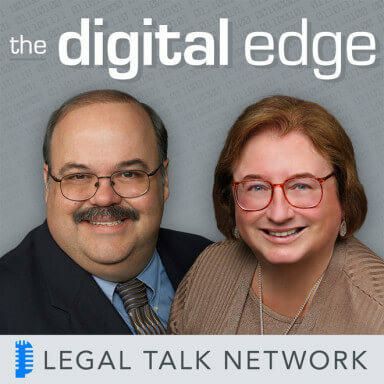 In this episode of The Digital Edge, hosts Sharon Nelson and Jim Calloway talk to Mark Tamminga who defines artificial intelligence and what its growing popularity means for lawyers. Their discussion includes the big players in the AI industry, the future of technology, and what Mark would say to lawyers concerned that robots will take their jobs. They also talk about the College of Law Practice Management’s Futures Conference 2017, for which Mark and Sharon are co-chairs. This year’s focus will be artificial intelligence and its role in the legal industry. Mark Tamminga is a senior partner at Gowling WLG, a platform from which to nudge his firm in the direction of rethinking how legal services and products are delivered. Sharon D. Nelson: Welcome to the 112th edition of ‘The Digital Edge: Lawyers and Technology. We are glad to have you with us. I am Sharon Nelson, President of Sensei Enterprises. Jim Calloway: And I am Jim Calloway, Director of the Oklahoma Bar Association’s Management Assistance Program. Today, our topic is Running with the Machines: Artificial Intelligence in the Practice of Law. Sharon D. Nelson: Before we get started, we’d like to thank our sponsors. Thanks to our sponsor Clio. Clio’s cloud-based practice management software makes it easy to manage your law firm from intake to invoice. Try it for free at HYPERLINK “http://www.clio.com” clio.com. Thank you to Answer1, a leading virtual receptionist and answering services provider for lawyers. You can find out more by giving them a call at 800 answer1 or online at HYPERLINK “http://www.answer1.com” www.answer1.com. Jim Calloway: Thanks to our sponsor, Scorpion, which delivers award-winning law firm website design and online marketing programs to get you more cases. Scorpion has helped thousands of law firms just like yours, attract new cases, and grow their practices. For more information, visit HYPERLINK “http://www.scorpionlegal.com/podcast” scorpionlegal.com/podcast. We are very pleased to have as our guest today, Mark Tamminga. Even knowing that culture eats strategy for breakfast, Mark Tamminga still signed on to be leader, innovation initiatives at Gowling WLG. He did it because it gives him as a senior partner at Gowling WLG, a platform from which to nudge his firm in the direction of rethinking how legal services and products are delivered. It also gives him a front-row seat to the most interesting developments in law practice technology, rapidly evolving tools and technologies like artificial intelligence, social networking or data analytics are fundamentally changing the law business, and Mark has determined that his firm will be a front-runner in the judicious deployment of the better toolkit that is emergency. Oh yes, and in his day job, Mark practices law in the area of creditors’ rights. Thanks for joining us today, Mark. Mark Tamminga: Thanks for having me Jim and Sharon. It’s great to be here and I hope we have a riveting conversation about a really interesting topic. Sharon D. Nelson: Well, we’ll count on you to make it riveting. Sharon D. Nelson: And you usually do. So most people are pretty much confused about Artificial Intelligence, especially lawyers; they really don’t know what it is, so can you explain Artificial Intelligence in a way that hopefully our listeners can understand those who are not familiar with it? Mark Tamminga: Well, yeah, I can try and because it’s for me the term is misleading and not helpful, unless you actually look at the words themselves and say Artificial Intelligence. We’re not talking about general artificial intelligence which is a technical term for human-level understanding. That’s not any of this is about. It’s much, much more helpful to talk about augmented intelligence, and all the tools that are emerging right now and some of which we’ll talk about later in the podcast are really about augmented intelligence, the boat running with the machines as Sharon and I like to talk about it. A lot of it goes back to some very fundamental changes in the way we interact with digital machinery, and there’s a really interesting book that Thomas Friedman just published called, ‘Thank You for Being Late’. It’s a great title, but he really points out key developments that happened in 2006 and 2007, and if you reach back, and it’s hard to imagine now, but in those two years, primarily 2007 and this is really interesting if you think about it. The iPhone, Facebook, Twitter, Android, Kindle, and here are two that are really important, Amazon Web Services and a new approach to parallel processing called Hadoop, all were released, they all came out at the same time. What they all have in-common is just a manifestation of Moore’s law that is that computing doubles in capability and at a constant price every two years, and that is the emergence UN deputies emerging with these emergent properties like cloud computing, suddenly becoming very available and Amazon Web Services led the way critically important. Vast amounts of online data, which Hadoop was able to then wrestle into a manageable form, primarily led by Google, but then at the same time, you had a completely transformational change in the way software was thrown at all on this and that was the emergence of neural networks learning programs, parallel processing, a whole bunch of different ways of talking about it. But all of these tools came together at the same time to suddenly allow the emergence of effectively learning programs. Without the Internet, none of that really works, so you need the cloud, and without the learning programs, it would just be nothing but unstructured vast amounts of data. You throw learning at the vast data, that’s sitting on the cloud and suddenly have a whole new thing and that’s the ability to start looking in that data more meaningfully and you take a lot of cognitive science and you apply that to the problem and you have stuff that begins to look a little bit like smarter computers and you have to then start thinking about it in terms of, if you think about Artificial Intelligence it’s the same as looking at other artificial things that human beings do. We fly, let alone we fly like birds, we fly in airplanes, and so Artificial Intelligence may not look anything like human intelligence, and as it sits right now, the augmented intelligence that we’re seeing is truly organized around what the specialists call “narrow” or “specialized AI”, and that’s not necessarily programmed specifically in a classic sense using either database technology or classic if-then programming, it’s learning programming. These new software tools are trained, they learn, and so it’s actually very important distinction, and with that comes a much better understanding of what you can do with those tools. In that they need to be taught specific domains in very narrow areas, so we’ve had some breakthroughs in what artificially intelligence, augmented intelligence tools can do in the gaming space for instance, of course there’s Watson, but much more interesting is Go, right? The AlphaGo breakthroughs of last year were astonishing and a huge advance in the way computing could attack these extremely dense problems. But then even more interesting, in just the last month or so, is a computer that can beat anybody in poker. Now that is amazing because now you’re talking about a computer that can tell if its opponents are bluffing. That knows the statistical realities of the cards that have been dealt and what its own hand is like. This is a much more interesting approach to things. But that poker player computer is not going to be able to play checkers, and so, you have these very narrow domains where these things are all brought together in very specific ways, taught with a great deal of effort to do a number of things that hitherto had always been done by humans, but they’re still in the order of routine repeatable tasks, and so we’ll talk a little bit more I think as this progresses about some of the implications for the legal profession, but it’s not limited to the law business. You’re seeing this in journalism, you’re seeing it in a number of other areas which had been a domain previously of highly trained individuals, humans. Jim Calloway: Mark, most people by now have heard of ROSS Intelligence and we’ve even had podcasts about ROSS before, can you tell us your thoughts about ROSS and what it does? Mark Tamminga: Yeah, well, sure, ROSS is one of the more prominent early players in the AI space and let’s use AI as an easy way of talking about as long as we all understand that what the Artificial means, and in this case, really talking about a new approach to research that uses IBM’s Watson technology which people remember from the Jeopardy days, but Watson is now used in the medical profession extensively for cancer diagnosis, used in translation and researches. It’s a whole bunch of other areas and Andrew Arruda and his people at University of Toronto had the insight to apply IBM’s technology to the legal space, primarily in the area of research, and early on, primarily in the area of bankruptcy law, and so they’ve been able to make quite a bit of progress on allowing in very specific domains of law practice where certain research questions come up frequently. One of the other issues that now is deviling the law profession is that clients no longer willing to train our young lawyers, how to be good lawyers, and that’s always been a time-honored practice in large law firms as you just get young lawyer to research problems. That job is no longer economically viable in a lot of circumstances, so the emergence of a tool like ROSS, which allows those lawyers to ask natural language questions of the curated space, and by “curated”, I mean, really combed over by experts and the ROSS computing environment has been trained in the specific domain of say, bankruptcy law or trademarks or some other area taxes and other environment-rich for the mining here, where you can ask it natural language questions, like, how can I get discharged in bankruptcy for a student loan in Arizona? It’s an example that’s come up in ‘The New York Times’ article recently. The answer turns out to be a three-part test and you could do that research in classic research tools but you’d have to be familiar with Boolean logic exclusions and all kinds of other highly specialized search techniques. This is a whole lot more direct from the question to the answer. There’s a premium put on the natural cadence of the question itself and then there’s also a premium put on the relevancy of the answer and you can — even after you’ve engaged ROSS, you can train it to either do more like this or a little bit like a little bit less of that, and really get to a point where as you and the tool work together, you actually get better which is why it’s so important to keep in mind the idea that this is augmented intelligence. It really is about the lawyer and these tools working together in ways that I think are highly beneficial. Sharon D. Nelson: Well, another major player, I think, most lawyers know of ROSS, but another major player is Kira AI, which I know your law firm uses in which we’re seeing more-and-more about online, can you tell us how your firm uses it and what value it brings to your firm? Mark Tamminga: Sure, Kira is one of our locally grown in Toronto again and that’s a slightly different branch, where you were looking at the realm of documentary due diligence. I like the example that I hear frequently in a circle about you are buying a — let’s just say a real estate lawyer you want and you are responsible for the sale of a mall — the purchase of a mall, I should say, and you’re going to have 250 leases that have to be reviewed. Historically that would mean some poor person would have to read all of them because you’re looking for the termination clauses, the expiry dates, the renewal clauses, various things that are important in leases, you want to find the outliers and you just don’t know where those outliers lie and that ground war through those documents is soul-destroying work. What here comes in and it’s pretty much direct competitors Raven is that they’re able to take those documents. You train it on a subset, say five or six, and those documents are an arbitrarily small number, but sufficient to 13:25 domain that would allow, then once you’ve gone through the training exercise you throw the whole business at it assuming they are all machine-readable, you just simply say here, here are 250 leases, a quarter second later you get everything set out in spreadsheets, here are all your termination clauses, here are all your renewal clauses, here is your net lease costs, those sorts of things, and it’s all laid out and you can continue to iterate until you get to a solution that suits your purposes. The result is going to be more accurate than if a third-year associate had read all 250 because by the time, he’s read about eight of them, he just wants to die or she just wants to die, it’s just not a good idea. That used to be the only way to do it, but using these tools on the matter that we used him for here at Gowling WLG, we had a significant client that had hundreds of or thousands of documents actually that needed to be reviewed but they were actually not alike. When I say about leases, every lease is kind of like every other lease. They have certain characteristics. This was a much more freeform documentary flow, it’s still a contractual analysis problem and so we bumped into a learning issue that hit us fairly quickly. Kira was great to work with us and we were still able to make great use of it. We also saw the limit of the tool and that’s that if it’s a little off of its comfortable turf, it falls down really quickly, and that’s just the nature of it at this stage of the game because these are very early days, and so it’s remarkable for what it does as long as you understand what it does and don’t try to make it do things is not meant to do just like you’re not going to be doing spreadsheets in Word. Jim Calloway: I’ve watched lawyers try to do spreadsheets in Word, Mark. Mark Tamminga: It’s awful, isn’t it? It’s just the worst, I mean, it doesn’t make you want to cry. Sharon D. Nelson: Yes, indeed it does. Jim Calloway: Mark, can you briefly tell us, who are some of the other major players in AI and what their AI is used for? Mark Tamminga: Well, I know you want me to give you legal names but here they are, Amazon, Microsoft, Google, IBM, and Facebook. Those are the big players in AI, well, go into some specific legal players, but the reason you bring those people up right now is because that’s where all the hard work is being done. They have the big data, Google, I mean, who wouldn’t have more data than Google. Amazon look at how it’s dealing with its — and Facebook. IBM and Microsoft, they sit on top of enormous universes of data and so they are all scrambling to get at the learning tools and develop toolsets for release into the wild and here’s an interesting thing that’s going on. And Dan Katz has talked about this at the University of Chicago, where all of a sudden and really over the last few months, they’re giving this stuff away. So, Google is giving away its learning tools and open-sourcing them effectively. That has implications for the legal business too because it’s going to democratize a lot of these tools. It’s going to make them, currently, Raven, Kira, they are all selling their services at subscription rates and they’re very expensive. That’s going to change. That’s going to change Moore’s law speed at computing speed probably faster because the interesting thing about software is it’s a Moore’s law multiplier, you can go through examples in networking, how software allowed multiplexing, and nothing changed but the underlying hardware is just all of a sudden they just jammed more stuff in-between spaces. Same thing is going to be happening in Artificial Intelligence, whereas these tools are simplified and the building kits are made more accessible, you’re going to find a lot more of these tools, infiltrating their way into the back offices of law firms, in the business intelligence software they’re going to be using. You already have people like BigSquare and Iridium BI experimenting with Artificial Intelligence. They’re the big players in the BI accounting space in law firms, but you’ve also that you’ve got obviously ROSS is using Watson, so IBM is all over that, but a lot of the other legal players in this space are, they are building their own tools or they’re just pulling tools down from any one of these suppliers and they’re really then being the first to tilt them in the legal field. What isn’t changing yet though is the amount of effort necessary to curate a space. So if you go back to talk to anybody at the early days of Kira, they were talking about how they would be perhaps taking a couple of months to work their way through a non-disclosure clause and get the system recognize that. It took them way longer than that. They ultimately beat the problem but it turned out to be a hard problem. That notion of teaching the machine is still reasonably tough in the software sense. So other players that people are going to find really useful in a legal context are, well, I mean, there’s the well-known ones like Neologic, which is really an expert system, Knowledge Automation really, and it doesn’t use — it really isn’t machine learning system because if there are really two main approaches you can either build the logic up meticulously and then have get answered questions as if it’s a pinball making its way down to the answer, and that’s what Neologic does, those carefully constructed logical structures. They end up being kind of brittle because of the world change, you’ve got to change the entire logical structure and then you have the inferential kind of Artificial Intelligence. We just throw a whole bunch of stuff at it, see what the software makes of it, and out of that you can infer some documents or you could say here are — I mean, notionally here are 70 versions of this canonical contract, make me a 71st version of it. Nobody purports to do that yet, but that’s kind of a goal that other people have. You also see a lot of it being used in certainly eDiscovery; more-and-more you’ve got catalysts and take care of the relativity, recombined, being able to de-duplicate certain kinds of communications, finding relevance in documents, and that all speaks to another aspect of the machine learning side and that’s natural language understanding, not just natural language parsing, but actually getting it in the same way that Watson was able to get the jeopardy questions. And so that machine learning side, where it actually is beginning to do the natural language work has tremendous implications for the legal profession given how natural language intense we are and there’s a language profession. You get into prediction software like Lex Machina and some of the other tools, premonitionism is a good example, and then in the legal research field everybody is jumping on, I mean, no one is going to let ROSS get away with just being the only game in town. So I mentioned Raven and there’s also Blue J Legal now, another Toronto company that’s focusing on the tax space, and I’ve kind of wondered why tax would take as long as it did because it’s such an arcane subject matter but it’s just vast. It seems to me and be ripe for, this kind of treatment, so now we’re starting to see it, Blue J Legal, and then the big players are starting to pile on because they got money Thomson Reuters, Bloomberg, LexisNexis, expect interesting things from them because this is all moving at incredible speed. Sharon D. Nelson: Not getting enough cases from the Internet, the kind of cases you want, Scorpion can help. Over the last 15 years, Scorpion has helped thousands of law firms, just like yours, attract new cases and grow their practices. During this time, Scorpion has won over 100 awards for its law firm website design and online marketing success. Join the thousands of law firms which partner with Scorpion and start getting more cases today. For more information, visit HYPERLINK “http://www.scorpionlegal.com/podcast” scorpionlegal.com/podcast. Is your firm experiencing missed calls, empty voicemail boxes and potential clients you’ll never hear from again? Enter Answer 1 Virtual Receptionists. They are more than just an answering service. Answer1 is available 24×7. They can even schedule appointments, respond to emails, integrate with Clio, and much more. Answer1 helps make sure your clients have the experience they deserve. Give them a call at 1-800-answer1 or visit them at HYPERLINK “http://www.answer1.com/podcast” answer1.com/podcast for a special offer. Welcome back to ‘The Digital Edge’ on the Legal Talk Network. Today our subject is Running with the Machines: Artificial Intelligence in the Practice of Law. Our guest is Mark Tamminga, a senior partner and leader of innovation initiatives at Gowling WLG. Mark, our friend, Ed Walters, the CEO of Fastcase says that Artificial Intelligence today is about 5% reality and 95% hype. It doesn’t mind taking a stand as you know, so tell me if you agree with his percentages, and certainly, why you think there’s so much hype? Mark Tamminga: Well, I agree with the percentages and I go, Whoa, Holy Crap, because it’s all moving with Moore’s law speed. So if it’s 5% reality and 95% hype, then I think we all have reason to pay attention because next year is going to be 10 and the year after 20 and the year after that 40 and then we’re there. So there is a lot of nonsense talked about it, but it is a real cong. Augmented intelligence is a very real adjunct to legal practice and it’s coming for all of us. Jim Calloway: The chief fear of most lawyers is that AI will take some of their jobs, what would you tell these lawyers? Mark Tamminga: They’re right. There’s no way around that, I mean, when you look at this, there’s the concept of technological unemployment that I think is a very real social problem. This is just my personal opinion but from what I’m seeing there are large parts of the legal practice, so it will be just fine, thank you very much for any meaningful career that’s now in play. You can read Richard Susskind and you will know that most of the professions are doomed even the pastoral possession and even medical, and so, it’s very useful to think about it now and there are all kinds of ways to accommodate what’s happening, and the only thing you are really — your real responsibility at this point is to prepare for the reality of some very significant software and software-enabled changes to legal practice. Our friend, Peter Krakaur, just wrote a great article called ‘I Am an Al Luddite and You Should Be Too’ but he gets into it and his basic advice is, is to step up which is, well, he’s actually laid it out in five points, a step-up, step-aside, step-in, step narrowly, or step forward. Each of those is a way of accommodating the inevitability of augmented intelligence in legal practice. To step up is simply give big picture advice and on how to implement the augmented intelligence tools show leadership, stepping aside, of course is to just do work that’s not amenable to computing which would be involved sympathizing counseling, getting involved in the intimate interactions that social beings have. If you’re going to step in, that’s doing the actual AI training, where you show how it can be used in legal practice. Step narrowly is to do something that is really a job that no one else can do where you are actually a self-taught expert. Finally, step forward is to create the actual AI systems themselves. Those would be data scientists that are legally trained. You got to find a slot in there or you’re going to be in trouble. Sharon D. Nelson: Well, I certainly agree with that and my own prediction has been that AI will accelerate rapidly in the coming decade. Do you agree with that and what kind of developments do you foresee over the next decade? Mark Tamminga: Well, I do, and of course it will. It’s again subject to all of the other technological drivers that are a self-reinforcing virtuous circle and we will result in unimaginable true Artificial Intelligence, and by that, I mean, machines are no longer necessarily bound by a given narrow domain, I can play Go, that’s it, I can’t play Checkers. You’ll have a machine that can play any kind of game and beat you at it. You’ll also have machines that fully understand the tax rules. I still think that there’s always going to be a role for the trusted advisor, but it’s going to be more artisanal in its own strange twisted way, and by that I mean, people still want to deal with other people on so many things. That could change because 10 years is a long time from now, but I think that the AI we’re seeing right now is rudimentary at best. How it changes over the course of the next two or three years, it probably will still be rudimentary, 10 years from now, it’ll be very, very sophisticated. Jim Calloway: Mark, there are a lot of ethical concerns about Artificial Intelligence, can you talk about some of them and how you think they will be addressed? Mark Tamminga: Yeah, I think that there will be as we become more reliant on these tools, there will come a time when — and already we see this in some of the decision-making software is — or sort of decision-suggesting software is an inability to determine how a machine learning program arrived at its result. So, this notion of a decision audit is now something of great concern to a lot of people, particularly, if the judiciary becomes enamored of Artificial Intelligence and begins to rely on it more, unless you’re able to really map out how a given decision from an artificial intelligence or augmented intelligence came to be, you don’t really have the full confidence that you have with most human decisions. We’ve culturally adapted to those. Yes, they could be wrong, but it’s the same thing with autonomous driving. If a human being gets into an accident, it’s an accident. If an autonomously driven car gets into an accident, it’s national news. So we’re not making our way quickly enough to the social changes that would allow us to responsibly adapt to these new technologies. Sharon D. Nelson: Imagine what you could do with eight extra hours per week? That’s how much time legal professionals save with Clio, the world’s leading practice management software. With intuitive time tracking, billing, and matter management, Clio streamlines everything you do to run your practice from intake to invoice. Try it for free at HYPERLINK “http://www.clio.com” clio.com. Jim Calloway: Mark, I understand that you and Sharon are the co-chairs of the Futures Conference of The College of Law Practice Management slated for October. Can you tell us a little bit about the conference and let our listeners know how they can register for the conference? Mark Tamminga: Oh, definitely. Sharon and I are co-chairing the Futures Conference which will be devoted this year to Artificial Intelligence. It’ll be running with the machines and it will definitely take a look at the implications of these emerging technologies in both legal practice but also for the legal function within corporate law departments, and we have brought together a pretty stellar panel of the world-leading thinkers in Artificial Intelligence Expert Systems, Augmented Intelligence tools. We will be going through some practical examples and really trying to provide attendees with a reality check number #1 in terms of where all of this technology is at? How it might have implications, real implications, practical implications for legal practice, and for servicing clients and how clients might want to interact better with their lawyers, but it’ll also bring together a group of really high-level attendees, who are contributing in the conversation and we find it a very collaborative and fruitful meeting to be had. Sharon D. Nelson: And how will they register, Mark? Mark Tamminga: To register for the Futures Conference called Running with the Machines: Artificial Intelligence in Law Practice, go to the College of Law Practice Management website which is HYPERLINK “http://www.collegeoflpm.org” collegeoflpm.org and the actual conference itself is on October 26 and 27 in Atlanta. So, it will be a Thursday and a Friday in Atlanta, beautiful time of year to head out to Georgia. Eat some peaches. Sharon D. Nelson: Absolutely, well, everybody needs to think about coming. It’s going to be a great conference and it was just such a pleasure to have you on the show today, Mark, and to hear your thoughts on Artificial Intelligence, you and I and our daily exchanges both by phone and by e-mail probably have almost heard enough of the topic for a while, but actually we both are kind of — I think we’re both inspired by it and we look forward to discussing many of the changes that will impact the practice of law in the future with so many experts present, that will be wonderful, and thank you for sharing your expertise with us, which is pretty cool. Mark Tamminga: My pleasure, and in the six months or so that we’ve been organizing this conference the entire field has shifted. So Sharon and I are on a volcano here, watching an amazing set of developments unfold before us. Sharon D. Nelson: But it’s a heck of a ride, right? Sharon D. Nelson: Well, thank you so much for being our guest today, Mark. Mark Tamminga: My pleasure, and it was great to be able to share some of these thoughts. Sharon D. Nelson: And that does it for this edition of The Digital Edge: Lawyers and Technology; and remember, you can subscribe to all the editions of this podcast at HYPERLINK “http://www.legaltalknetwork.com” legaltalknetwork.com or on iTunes, and if you enjoyed our podcast, please write us on iTunes.